I am in the process of moving from S9Y to WP. The main reason being I want thumbnails and titles (links) to the 8 video articles we post each day – embedded from various sources – to automatically go to a large block between the head and content.. And when we add a new article one scrolls off. I am new to WP and wonder if this plugin is the answer, or if not what is the answer. We fixed Hugo’s problem, which is apparently common in Chrome. I’ll add it to the next version, but don’t count on that coming out soon enough. Hi, seems that the plugin doesn’t works with latest WordPress release.. Yes, there were a LOT of changes to the media attachment pages in version 3.5. One of those changes broke the thumbnail generating and encoding. I have most of it figured out and will be releasing a compatible version soon. 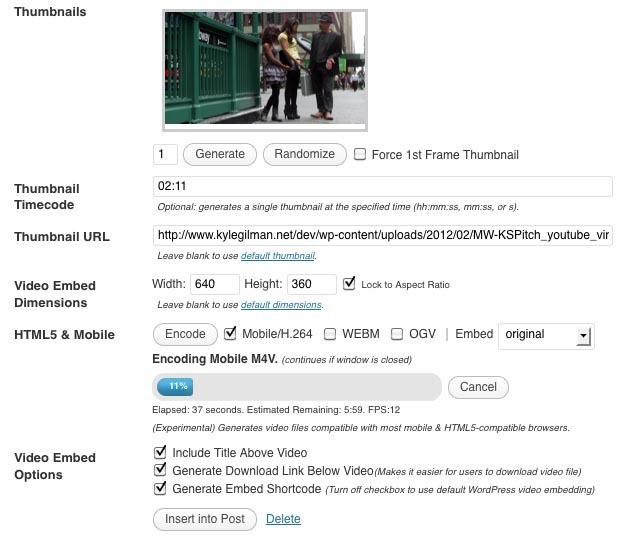 I’ll certainly try this video plugin as video will be a major component of this. @Jon pretty much all video is horizontal (wider than it is tall). Am I misunderstanding what you’re looking for? You can use my plugin to play video at any size or format you want though.